Things are a little more experimental this Friday as we take a look at two new free plugins from Puremagnetik; Expanse and Driftmaker. First up is Expanse, a texture generator that can be spectrally blurred, pitched and filtered. It creates filtered noise and layers a pitch shifted replica on top of itself, which then undergoes spectral blurring and freezing to create interweaving layers of sound. Creating these sounds is nice and simple, but there's a lot you can do with Expanse, making it ideal for drones and textural soundscapes. 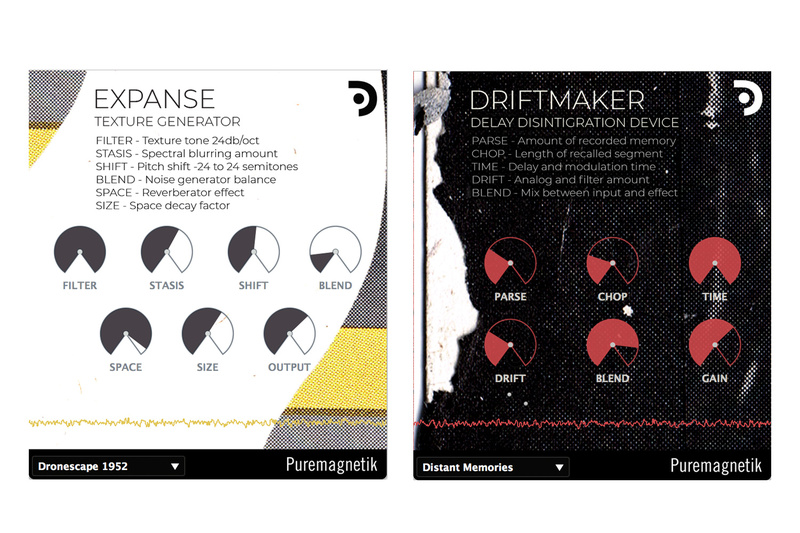 The second plug-in, Driftmaker, is a delay disintegration device. Parsing incoming audio and then lifts segments from the recording, granularly time-stretches segments and adds analog deterioration effects to the signal. The end product is all down to what you feed into it, so you can really experiment with a variety of different recordings to create some interesting sonics. Expanse and Driftmaker are available to download for free on both Windows and Mac (AU/VST) using the link below.